Most houses have chimneys of some kind running through them. They may be there for the furnace, a fireplace or a woodstove, but they all have one thing in common; they need to be kept in good repair to remain functional and safe. While major problems should always be taken care of by a professional, many homeowners can safely repair minor issues before they become a bigger problem. Many of the problems that plague homeowners surrounding their chimney start out very small and are easily repaired. Taking quick action can prevent these problems from growing and becoming something that must be taken care of by a professional. To make sure you stay on top of any problems that may arise, particularly in freeze/thaw climates or in areas where your chimney gets frequent use, inspect your chimney seasonally. Start at the top and work your way down. Look for small cracks, spalling bricks, missing sealant or a missing cap on the chimney top. If you see larger problems, like a cracked or missing sleeve, contact a professional. The cement around the crown of your chimney is one of the areas most likely to develop cracks. These cracks can lead to the cement crumbling away and forming some holes in the top of your chimney. Seal them up as soon as you find them to prevent this from happening. Fill any large cracks or missing areas with 100 percent silicone caulk. Then, smooth a layer of chimney sealant over the entire area. For a smoother repair, wrap duct tape around the base of each flue liner and the base of the crown. Apply the crown sealer by hand so you can push it in deeply enough; wear a disposable glove you can throw away once you're done to protect your hand. Bricks have less of a tendency to crack than they do to "spall." Spalling is a condition where the bricks begin to flake or have small pieces break away. Applying a coat of sealant to them will help protect them and prevent spall from occurring. Use a water-repelling brick sealant you can spray on. Spray the bricks with an even coat until the bricks stop absorbing the sealer and it begins to run down the bricks instead. Wait five minutes, then apply a second coat. If your chimney is missing a cap, or the cap is cracked or broken, you're welcoming the elements, debris and small animals into your chimney. This can lead to more cracks, clogs and possibly chimney fires. Installing a cap is fairly simple, and will help prevent these problems from occurring. Set the entire cap right on top of the flue sleeve, then tighten the screws. Take care not to over-tighten, as this could crack the clay. Just tighten until secure, then stop. Repointing: If the mortar between your bricks is cracked and coming out, call to have your chimney repointed. This involves digging out and replacing the mortar between the bricks and possibly straightening any that have moved. Chimney Liners: If your chimney is unlined, or the current lining has cracks or is broken, call in a professional to have it relined. There are several options for chimney liners; have your chimney inspected to find just the right one. 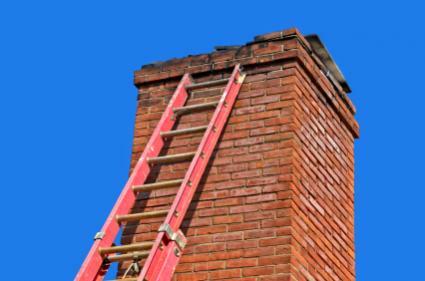 Cleaning: Have your chimney cleaned yearly to prevent creosote buildup and potential chimney fires. While your chimney sweep is up there, ask him to check for cracks and other issues you may want to take care of later as well. With just a little bit of maintenance and some minor repairs, you can keep your chimney operational for years. Make these repairs in a timely manner to help prevent bigger problems before they occur.